Cleaning your tile and grout is important to make your home look new and refreshing the way it had been when you’d purchased it. This method of cleaning your tile and grout works best with the white-colour tiles and grout. But, you need to take due care of not using bleach solutions anywhere in the darker colour tiles and grout. Also, make sure you take care of yourself as well while using the bleach solutions. Use old clothes for cleaning your tile and grout that are bleach-proof. Also, always wear rubber gloves as they are easy to clean and bleach-safe. Don’t forget to protect your eyes from bleach solutions using safety glasses and always keep windows open while working. BEST Solution – Add the vinegar solution to the baking soda paste. Use this solution for the effective cleaning of your tiles & grout. 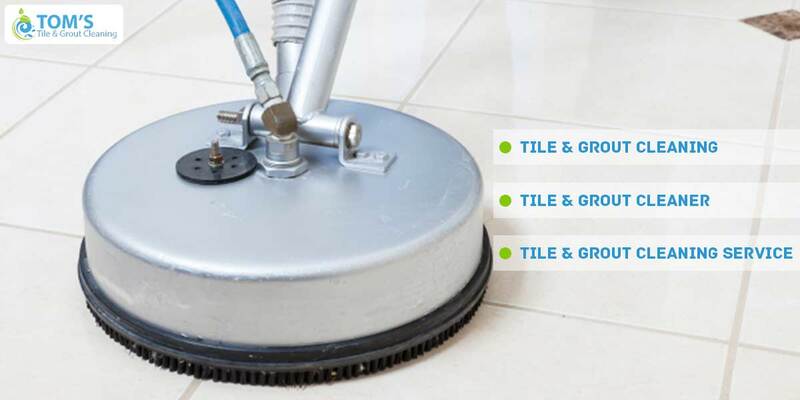 The steam cleaner is the most professional and eco-friendly method to clean your tiles and grout. Most of the leading tiles cleaning companies use this method because of this effect in cleaning. It cleans the dust and hard stains too easily and effectively as it is its heat and pressure that works. Finally, you can see your floor shining away giving a fresh and inviting look to your home. TIP: If you want to keep this shining floor every day, you can use the oxygen bleach in your mopping water and mop your floor with this mixture of water. This will give your floors a sparkling look each day. If any of the above solutions do not work for your hard dirt & stains on your tiles & grout, don’t try any other solution. Instead, call the expert tile cleaning professionals. Do you need any help with cleaning your tile and grout? Toms has an expertise and experience of cleaning the hardest of the stains. Call us now.